JEFFERSON GOLDEN HOUR CLOCK EXCELLENT CONDITION KEEPING ACCURATE TIME. THE GOLD FINISH IS OK NOT PERFECT, SEE PICTURES. WIRING IS ORIGINAL AND HAS ORIGINAL BODY PLUG FOR HOLDING WIRE TO BODY. I HAVE TESTED CLOCK AND RAN FOR HOUR. Vintage 1950's Jefferson Golden Hour Mystery Clock Working Bellwood Ill. Here's a nice clock. 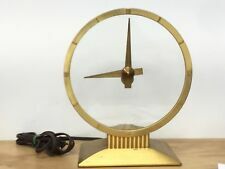 Jefferson Golden Hour mystery clock, circa 1950's - 60's, made by Jefferson Electric of Bellwood Illinois. Appears to be in very good condition, just needs a good cleaning. A classic! The gold 24k has a brilliant finish and shows real nice. If you want one to be proud of and works like it should, this is it.This clock was also cleaned with an ultrasonic cleaner which brings out the gold finish.date built is 1956. Beautiful clock by Jefferson. Golden hour electric clock stands 9" tall. Face is invisible. I have only wiped the dust away and have not done any polishing or restoration. See photos for normal wear from age. Inclined plane clock base. Blows 'em all away. Hard to say what the monetary value is, because there's nothing to go on, as it's probably the only one. I can't imagine this being made in any sort of multiple quantity, and it seems logical and "fits the bill" as a "one off" show piece, such as a presentation piece to a Dignitary, King, Queen, etc. The glass dial has a little chip on the upper right corner, however, it doesn't effect the proper working order of this clock at all. We believe in communication. Nice pair of hands, I believe the are from a Jefferson Mystery Clock. This book explains how to disassembly, clean, repair and reassemble the Jefferson Golden Hour “Mystery” clock. The Golden Hour clock can readily be found at garage sales and flea markets. Now that doesn’t need to happen. 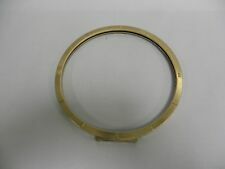 This Jefferson golden minute clock base cover and screws are in great used condition there are normal use scratches and marks. The three felt pads are in tack. Here is a nice art deco clock that is need of repair. Lower 48 states only. Mystery Clock ?. 30 Hour Longcase ?. Jefferson Golden Hour Mystery Clock Repair Service -- CLOCK REPAIR SINCE 1844!! This Service Is NOT For The : Jefferson Golden Minute, Jefferson Golden Helm, Jefferson Golden View, Jefferson Golden Secret, Jefferson Suspense Or Any Other Jefferson Clock. We Are 4th and 5th Generation Professional Clockmakers.Father 69 Years Experience & Son 37 Years Experience. The clock is a hard to find small version. The mainspring barrel is missing several teeth. Small size Moreau swing clocks don't seem appear too often. The clock is sold for parts - As is - as seen.